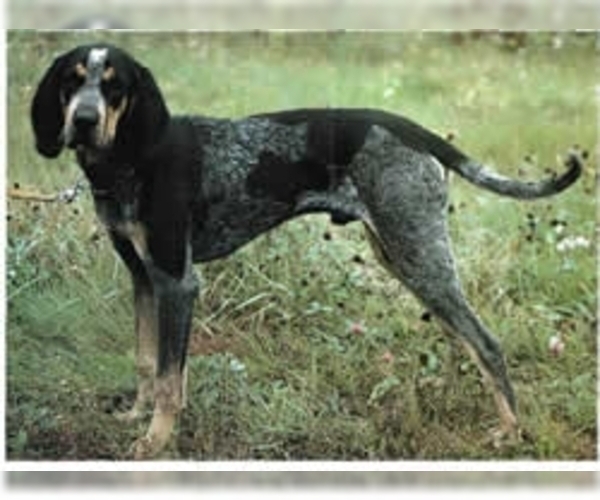 Overview: The Bluetick Coonhound loves to hunt and is good at treeing animals. They do well as pets in homes with large yards. Coat: The coat is short and sleek. It's dense and a bit coarse to the touch. Character: The Bluetick Coonhound is intelligent, loyal and has a strong instinct to hunt. Temperament: The Bluetick Coonhound is good with older children and most other dogs. They don't do well with other animals, particularly small ones that they may try to hunt. Care: The coat should be brushed occasionally. The ears need to be kept clean to avoid infection. Training: The Bluetick Coonhound accepts training well. Start training when the dog is young and use frequent sessions. Activity: This breed needs a large, fenced yard to run and play. Walk them on a leash to keep them from treeing other animals in the neighborhood. Posted Breed: Bluetick Coonhound (short coat). Adoption Fee: 400.00. Posted Breed: Bluetick Coonhound / Bluetick Coonhound / Mixed (short coat). 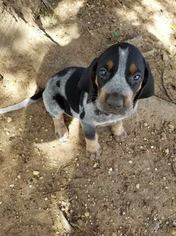 Posted Breed: Bluetick Coonhound (medium coat). Posted Breed: Bluetick Coonhound (short coat). Adoption Fee: $100. Posted Breed: Bluetick Coonhound (short coat). Adoption Fee: $285.00. Posted Breed: Bluetick Coonhound (short coat). Adoption Fee: 150.00. Posted Breed: Bluetick Coonhound (medium coat). Adoption Fee: $400.